Police in the Indian state of Haryana have arrested four people over the killing of a couple who were planning to marry despite family opposition. A 23-year man was beaten and beheaded and his 20-year-old girlfriend was also killed in Rohtak district on Wednesday, according to police. The woman's father, mother, brother and one other person have been held over the murders - they made no comment. Police told the BBC they were treating the case as an "honour crime". So-called honour crimes are common in India, where many still prefer arranged marriages within their own caste and love matches are often frowned upon. The funeral pyre of the man was still burning when I reached the village cremation ground. A little later about two dozen men came along with the young woman's body in shrouds. She was cremated quickly. Men looked grim but remorseless. They said they had no option but to kill the couple because they had brought disrepute to the families and village. Some of those attending the woman's cremation said they had had to kill the two to teach others a lesson. We cannot allow marriage in the same community, they said. The girl and the boy, who both belonged to the Jat community, had been in love for two years. Dharmender Barak, 23, and Nidhi Barak, 20 were allegedly killed by members of the woman's family in Garnauthi village in Rohtak on Wednesday evening. A police officer told the BBC the couple were college students and were planning to get married, a move allegedly opposed by the girl's family. He added that they were also investigating why the man's family had not registered the crime with police after the incident. 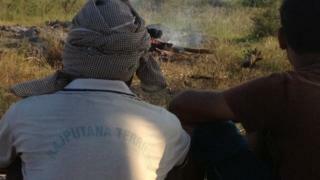 The BBC's Zubair Ahmed, at Garnauthi village, was in the village when the bodies were being cremated. He reports that the villagers attending the funeral said they had had no option but to kill the couple. Villagers said the couple were forbidden from having a relationship because of traditional caste rules governing marriage in parts of northern India. The couple had left their homes in the village on Tuesday morning and did not return as they had planned to get married, according to reports. Ms Barak's family is then alleged to have contacted her on Wednesday morning and asked her to return home after reportedly assuring her that she and her fiance would come to no harm. The full details of the attack are still emerging, but it took place in public view - reports say relatives of the woman beat her to death and then cremated her. They then beheaded the young man and threw his body out into the street. "Our preliminary information has revealed that when Dharmender and Nidhi returned to the village on Wednesday, they were taken to Nidhi's home. They were both assaulted by her relatives. Nidhi's family first lynched her and then cremated her," local police official Anil Kumar was quoted as telling The Indian Express newspaper. "Then they broke Dharmender's arms and legs and beheaded him." There are no statistics on the number of "honour" killings across the country, but according to one study, hundreds of people are killed each year for falling in love or marrying against their families' wishes. In 2011, India's Supreme Court said so-called honour killers should face the death penalty.